The beach chair is very convenient for days spent at the beach. Not only that, they are also quite handy and practical for camping, tailgating and other kinds of outdoor activities. Beach chairs are made from a variety of materials and they come from different manufacturers. Some models can be used by individuals of all ages, while there are others which are age-specific. If you want more information about what beach chairs can do for you, you can read reviews about the product. This is a review for the Kijaro Coast Beach Sling Chair. Are you the type of person who often likes to unwind by means of a camping trip or a trip to the beach? Then you are probably aware of the essentials that you should carry along on those ventures. One item that you must always tote along is a lightweight, portable chair. If you have one, you won’t have to sit on the ground and get soil or sand all over your rear. If you are camping, you need to have a folding chair that is comfortable, since you are going to spend most of the day going from one location to another other than your home. For the beach, you need the kind of chair designed for such activities to be able to completely relax and enjoy the scene. One example of a quality beach chair is the Beach Sling Chair from Kijaro. Kijaro has been making outdoor fixtures for a good while now from camping chairs, shades, and hammocks to backpacking equipment. They are known to manufacture nothing but quality stuff, and this beach sling chair is one of their better products. The item comes with a steel frame for strength and support. It is built in a manner that will not allow it to sag, and it allows users to become comfortable while they’re seated on the chair. The chair also comes with an organizer that has mesh and zip pockets. It also includes dual cup or drink holders so you can have your choice refreshment by your side without worrying about spills. The chair’s back is composed of breathable mesh material so users will be allowed to have a steady supply of fresh air over the course of usage. It provides additional support and improves the comfort and posture of its users. It is capable of accommodating the weight of up to 250 lbs. so it is recommended for people of all ages. This is a multi-purpose model because it can serve as a seat for beach vacations and as a comfy chair for your camping trips. While the back of the seat has mesh parts for better air circulation, this can be a bother for some. The mesh part leaves the back of the user exposed to the wind or cold, so use this with caution on cold and nippy nights at your camping spot or at beaches with the wind at your back. Furthermore, because of the mesh material, the chair is not as compact as other beach chairs. The carrying case of the unit may also seem superfluous because the product already comes with a strap. The case is composed of a material that’s the same as the material covering the seat, thus, at times, it can be a bother to put it all inside. Some may also find the cup holder’s size to be a bit small. Lastly, you have to remember that this model has a lower center of gravity, so you may have some difficulty getting up and down from the seat. The Kijaro Coast Beach Sling Chair might not be for everybody, but if the features interest you and they are just the things you need, then you should give this one a shot. Despite its minor drawbacks, it is still a nice buy because of the way it was built, the materials it was made of and its portability. Just keep in mind to try the chair out, because this one has a lower center of gravity. 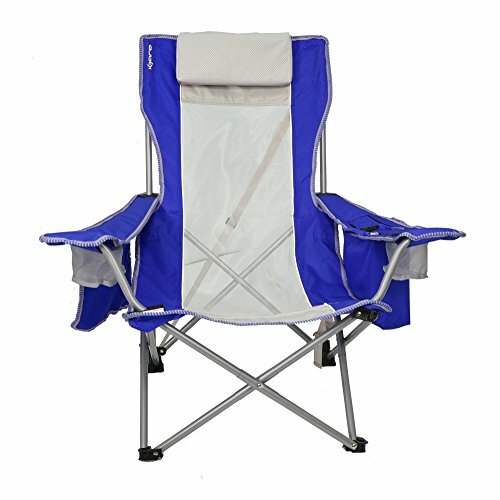 It is recommended for folks who want a portable folding chair for the beach and for camping pursuits.